An expansive, bespoke Natural Pool with superb finish, giving the owners a fabulous outdoor living area beside the water. We were asked to create a Natural Pool with a contemporary feel, good for swimming lengths, playing water polo with steps leading to a child friendly shallow end. A large larch deck with fire pit and breeze house, wraps around the pool at the deep end, creating a superb outdoor living area beside the water. The clean lines of the submerged walls with their bull nosed stone coping, compliment the strong, curved pool edge, carefully designed to fit into the new garden. The swimming zone is a generous 7m wide, 2m deep and 15m long. It feels massive to swim in but is still practical to maintain. Features on the pool include a floating penny deck accessed by stepping-stones, a wide jetty and the reclaimed millstone is a beautiful focal point to enjoy from the deck. We particularly like the formal yet inviting paved steps leading down to the shallow end, framed with beautiful marginals. 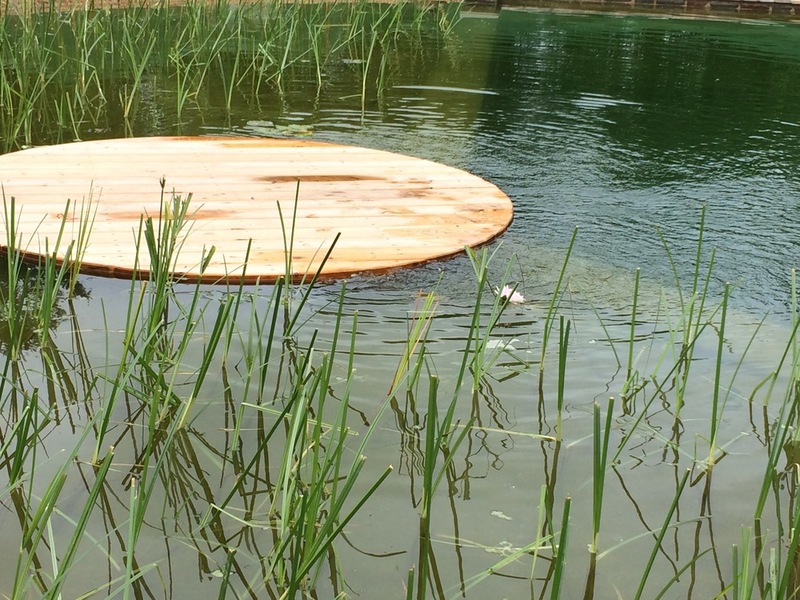 This is a superb project, which definitely got the thumbs up when we gave it our test swim recently!